Thanks for your interest in joining Prairie Urban Farm! Come out and join us at any of our garden workbees. Check the calendar for dates and times. 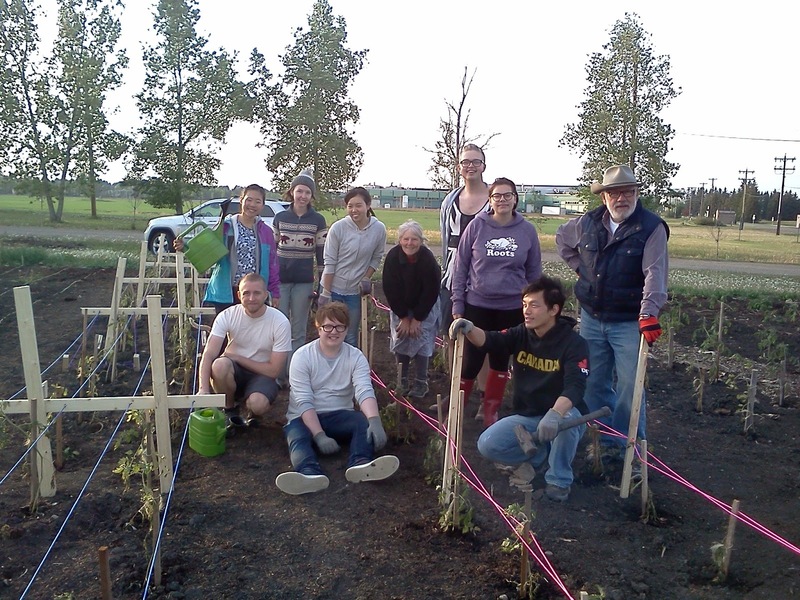 A great way to stay up-to-date on Prairie Urban Farm is to join our mailing list. This is how we send out cancellation notifications of sessions (in case of poor weather), other volunteer opportunities and upcoming events. 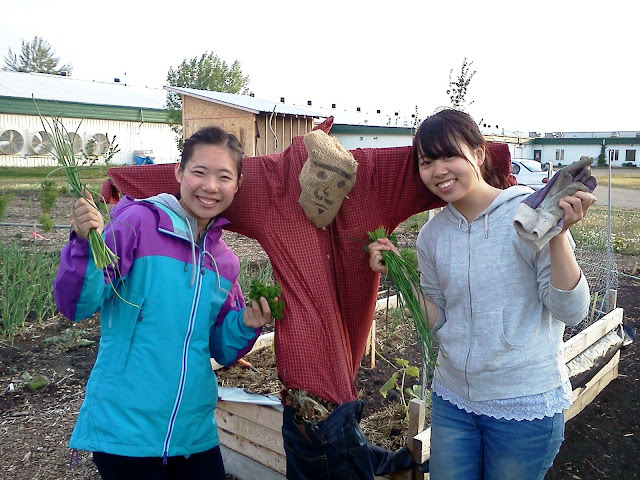 Volunteers posing with our scarecrow El Corado and the farm produce they grew! Volunteers get fully orientated on site by a garden leader during one of our regular volunteer drop-in hours. Sign up for our mailing list to be notified of when our drop-in hours are set each season! There is no minimum time commitment necessary, however, we do like to see volunteers once/week if they can make it. This helps us to communicate any changes at the farm and it's a better experience for volunteers as it allows you to see the farm progress through out the season and to be involved in each step of that progression! For a volunteer session we suggest you wear clothes that you don't mind getting a bit dirty in case you're kneeling in the dirt or it's muddy after a rain (this includes shoes that you don't mind getting a bit dirty). Also, bring a reusable bag (grocery store bag) to put some produce in for when you go home! A water bottle is good to bring as well (we'll provide extra water at the farm for re-fills). Other than that you don't need anything (we provide gardening gloves and all the tools necessary). Volunteers adding compost and mulch to our fruit trees in the spring. Prairie Urban Farm is located within the University of Alberta's South Campus in Edmonton, AB. Our farm is next to the Dairy Research Facility on 118 Street and south of 60 Avenue. If you are coming to Prairie Urban Farm by vehicle, you can access 60 avenue by turning off 61 avenue going towards the U of A, or turning off 113 Street southbound. The farm is very easy to access by public transit. The South Campus/Fort Edmonton Park LRT Station is a 15-20 minute walk away and many buses stop at this transit station as well. Many of the roads around and within South Campus are bicycle friendly including 113 Street and 122 Street. Wow, it's very exciting. May I become your member. I am an agricultural production enthusiast. I have run my own farm in the past. I am looking for a farm in Edmonton where I can hone my skills and contribute to knowledge. I wish to join your group.